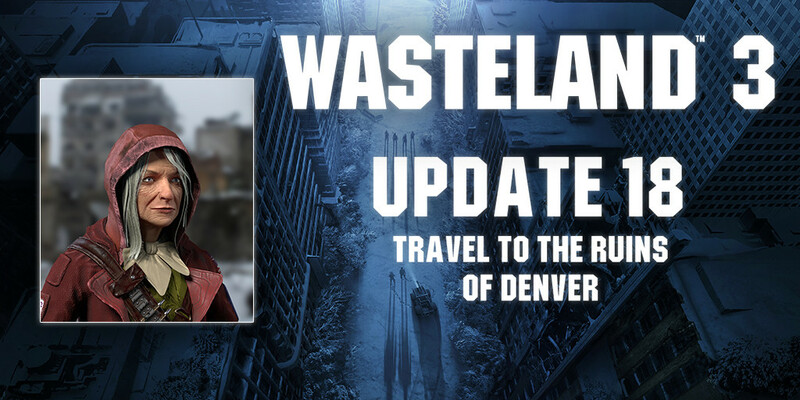 Today we've got a new Wasteland 3 update for you, introducing some more details on the Gippers, the Nancies, and Denver! Hello all. Gavin here to talk about the Denver zone in Wasteland 3. Most of Denver is in ruins. During the end of the old world, a nuclear weapon exploded high in the air over the city, killing most of the inhabitants. The skyscrapers that remain are jagged, crooked affairs that lean against each other. In their shadows, the lesser buildings have crumbled, forming ever-shifting mazes and subterranean tunnels of broken concrete and rusted rebar. These urban wilds are battlefields for the predators prowling the city, unaffiliated treasure hunters, and scavengers. Though the radiation is long gone, Denver is still a deathtrap, but one studded with buried riches from the old world. The Denver Airport Commune lies to the east of the ruins and is now a colony of artists, hackers, conspiracy nuts, mad scientists, and assorted eccentrics. The Commune is centered around the Space Shuttle Atlantis (which landed here sometime after the bombs fell), and is dedicated to strange experimentation, acts of cyber espionage against the Patriarch, and MANY other things. In the north is the mighty stronghold of the Gippers. We shared a glimpse of the Ronald Reagan-worshiping cult in an earlier update. As many of you recall, the Gippers were a faction we originally planned for Wasteland 2, but now they will be appearing in Wasteland 3. The leaders of the Gippers are the priestesses known as Nancies - wives to the divine God-President Reagan, lawmakers, and judges. Above them all is the fierce and formidable Mother Nancy Reliance. I like that a lot. Nancies. Well, at least the Gippers are honest about their paranoia. Also, the Nancy model is very good. Very reminiscent of Fallout. Glad to see the Shrekness dialed back. That said. She looks fine to me. It's an aspect of Fallout I don't mind. With regards to the Shrekness I was referring to the hard head shown in the Fig pitch; he looked a bit too Shreky for my tastes. He may be an outlier though. Ah fair enough.. I missed the Fig Pitch so probably didn't pay much attention to it. Sounds OK to me. A lot of interesting things swiftly described. I just think that The Nancy looks too later-Fallout to me. When you're going the photo-realistic route there's just no winning. Her outfit is just so sharply defined. At least, taken as it is, she looks good. Very human. So what's the penalty for crooks who rob a bank while wearing rubber masks of past presidents? The skyscrapers that remain are jagged, crooked affairs that lean against each other. Sounds good if you can actually enter such buildings and they have multiple levels with rooms, rather than being non-interactive props. Post-apoc urban exploration can be so interesting. Absolutely - I loved that in the original Wasteland, even if most buildings were just empty or used as trash dumps. Well, makes sense in such a setting that most places would be dumps empty of anything valuable, too bad players would just complain about how InXile personally forced them to explore every single room. Yeah, well - just don't put stuff into the junk that you can't do without. If players still stuck their nose in, it's their problem - or in my case fun. I would love to see procedurally/randomly generated "empty" areas with random loot and random encounters. A ruined skyscraper would make a great random "dungeon". Would also be cool to have to traverse places like this to get to story areas, e.g. go up several random floors to get to the quest location. Basically the same thing as having to deal with world map encounters between settlements, but on a more intimate scale. Really I want to see the "random encounters everywhere" ethos return from Wasteland 1. That way empty spaces and "already cleared" story areas would stay exciting. Also, as Colorado has mountains: give us caves and old mines to explore. Would also work like a charm with random encounters. As those would house animals mostly: give us annimal parts to use - leather, big claws and such to craft or improve armor and weapons. Maybe, like in many old games, only if one of the chars has some kind of trapper skill. Don't let animals drops nonsense like clubs and such stuff or only grey "for sale only" items. Good ideas, an abandoned skyscraper full of starving hobos and drug addicts with knives would be awesome, as well as add a dark theme to the game. I agree, Cross. Back to the old "This building seems to have been used as a garbage dump by the locals." and "This building hasn't been used in more than a hundred years." For me at least there was always that part of the game where you're going out looking for a large mass of enemies to wipe out. What are they eating? A skyscraper is a lot of space, what are they using it all for? Are they trying to store water, or grow plants? How many have gone bonkers? How many redshirt goons could you hire? What would the trade options be? What could you get for a handful of candy in a city without food production? "You could at least use a new rat on the third day, at least!"